The familiar saying that older people are being “long on the tooth” suggests that it is prearranged that as we get older our teeth get “longer” due to gum tissue and bone loss. This is absolutely not true. One does not have to have gum tissue and bone loss because of age. Gum Disease (Periodontal Disease) and loss of teeth is not an unavoidable aspect of aging. 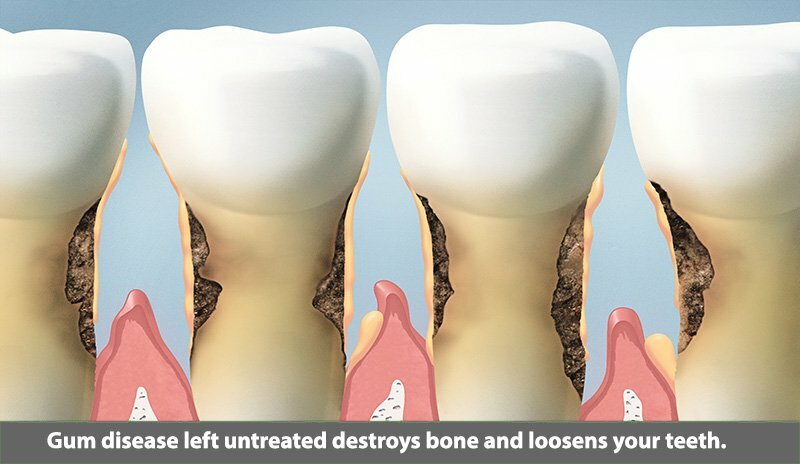 Loss of gum tissue and bone around a tooth is the result of a bacterial infection. If patients don’t have gum infections they will not lose the tissue around their teeth. There are risk factors that make older adults more susceptible to gum disease. Certain systemic diseases such as diabetes can decrease the body’s capacity to fight infection. Diabetics suffer with a higher increase in gum disease. Also, Osteoporosis can increase the amount of bone loss around teeth. To lessen the effects of systemic diseases on your dental health it is vital to maintain meticulous dental hygiene and to visit Dr. Nugent routinely for examinations and professional cleanings. Absence of saliva can result from the use of certain medications or as a result of illness. Also, age can decrease the amount of saliva. When one ages, the saliva becomes more mucus like and less watery. Dry mouth is devastating to the mouth. The saliva neutralizes the acid from bacteria and washes bacteria away. A decrease in saliva flow will contribute to periodontal disease. Oral rinses and artificial saliva is helpful with dry mouth. Furthermore, frequent sips of water or eating sugar free candy can help lubricate the mouth. Heart medications can have a effect on the gums by producing an exaggerated reaction to plaque that results in gum tissue overgrowth. Antidepressants can create dry mouth. This reduce the saliva’s ability to neutralize and wash away plaque. Immunosuppressants medications can reduce the body’s ability to fight infection increasing the risk for periodontal disease. Dr. Nugent and his Hygienists needs to be aware of any medications you may be taking. Physical disabilities can reduce dexterity and make brushing teeth difficult. Poor oral hygiene increases the risk for cavities and periodontal disease. Electric toothbrushes and floss holders are useful in improving oral hygiene. Increased visits to the hygienist is a good idea for patients suffering with dexterity problems. Dr. Michael Nugent is an award winning dentist in Pasadena, Texas. His office is located at 3421 Burke Rd Ste A, Pasadena, Texas 77504.